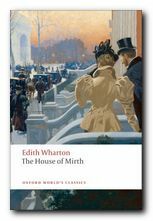 The House of Mirth (1905) was Edith Wharton’s first major success as a novelist. 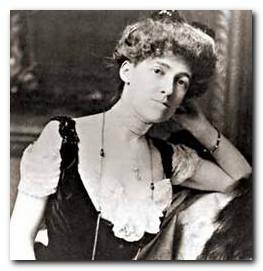 She had published short stories before, and even a best-seller on interior design – The Decoration of Houses (1897). 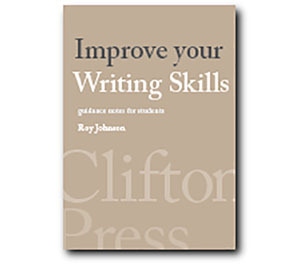 Indeed she went on in her prolific career to produce travel writing, essays, journalism, and memoirs. 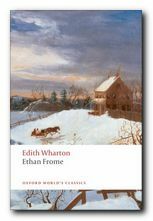 But from The House of Mirth onwards, she regarded herself as a serious novelist – even though she claimed that her apprenticeship to the art of fiction only ended with the publication of her novella Ethan Frome in 1911. 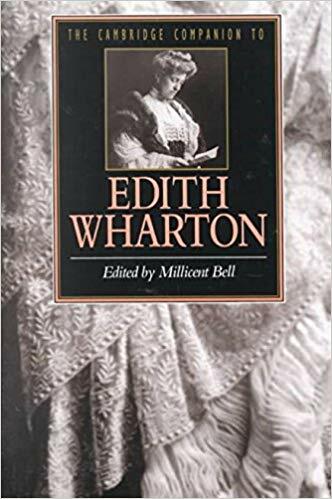 She wrote about a subject she knew intimately – the upper echelons of ‘old money’ New York society and their amazingly clannish not-to-say snobbish notions of what was and was not socially acceptable. Everything rested on the appearance of respectability, no matter how far its remoteness from the truth of things. Like other forms of upper class and aristocratic society its main impetus towards the preservation of power and influence via marriages based on wealth – preferably inherited. 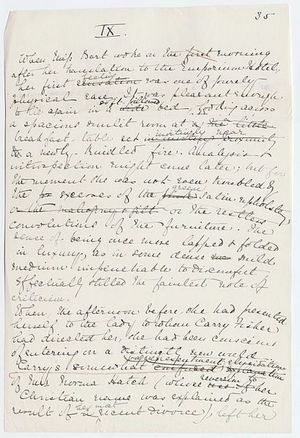 The possession of a family fortune means that a complete nonentity such as Percy Gryce is regarded as a desirable catch for any New York matron wishing to marry off a daughter, whereas even someone as beautiful and intelligent as Lily Bart has been unable to locate a husband, because she has no grand inheritance and has fallen in the social pecking order since the collapse of her father’s business. .
Lily Bart is a twenty-nine year old New York woman who has been raised in an indulgent and well-to-do family. When her father’s business crashes and both parents die, she is taken in by her rather strict and old-fashioned aunt Julia. Despite her good looks and lively intelligence Lily has been unable to find a husband and fears that her times and chances are running out. She is attracted to the lawyer Lawrence Selden, but he feels that he does not have enough money to afford marriage. 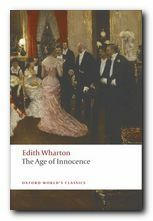 The novel begins with a scene in which Selden invites her to afternoon tea in his bachelor rooms – an innocent enough gesture, but one which ultimately is to have a decisive influence on her destiny. She is spotted by two people leaving the building, and both of them seek to profit from their knowledge later in the story. Lily mixes amongst people who are much wealthier than she is, and she feel both financially and socially disadvantaged. She entertains the notion of attracting Percy Gryce, a boring but wealthy young bachelor. However, distracted by her interest in Lawrence Selden, she misses her chance to captivate Gryce, and he marries somebody else. Having accrued gambling debts, and feeling that she cannot afford to keep up with the set with whom she mixes, she turns in desperation to Gus Trenor, a businessman who agrees to help her financially – but under rather vague terms that Lily chooses not to understand. She thereby puts herself under his influence, which includes being friendly to Simon Rosedale, a Jewish businessman who is buying his way into polite New York society. One day a cleaner from Selden’s rooms (which Rosedale owns) blackmails Lily with some compromising letters she has salvaged from Selden’s wastebasket – thinking they are from Lily. They are in fact from Bertha Dorset, a married woman, but Lily pays them to protect Selden – and keeps them. Enjoying newfound affluence as a result of Gus Trenor’s investment on her behalf, Lily is uncomfortable when he presses for reciprocal favours, but feels obliged to accept his ever closer friendship – even though he is married to one of her friends. In doing so, she develops something of an unfavourable reputation – which is reported to her aunt Julia by jealous rivals. Gus Trenor eventually tricks her into joining him late at night in his town house where he is alone, and once again he presses her for reciprocity. Lily narrowly escapes his clutches, but is seen leaving the house by Lawrence Selden, who happens to be looking for her at the time. Lily confesses her debts to aunt Julia, who refuses to help her. Finally Lily pins all her hopes on Lawrence Selden, who at one of their last meetings has declared that he could only help her by loving her. She has an appointment to meet him, but he doesn’t come. Instead, Simon Rosedale arrives with an offer to help her out of her financial problems, which she politely refuses. Lily is invited on to a Mediterranean cruise by Bertha Dorset, and this distraction allows her to put her financial and social worries behind her. But the invitation is a ruse to keep George Dorset occupied whilst Bertha enjoys an affair with Ned Silverton, a young man with poetic inclinations. When a rift between the Dorsets threatens to become public, they close ranks and Lily is expelled publicly from the cruise. She returns to America to find that her Aunt has died, leaving the bulk of her estate to her longtime companion Gerty, and Lily a legacy of $10,000 – precisely the amount she owes to Gus Trenor. Rejected by her former friends, she begins to mix with ‘new money’ people who are trying to climb into fashionable New York society. She is pursued by George Dorset, but rejects his advances, and finally offers herself to Simon Rosedale. But he will only accept her if she uses Lawrence Selden’s letters to bring about a truce with Bertha Dorset, which she refuses to do. She goes to work as an assistant to a rich divorcee who is trying to gain entry into society, but Lily realises that this will once again tarnish her reputation, whether she is successful or not. So she then takes employment as a milliner, moves into a cheap lodging house, and begins to take comfort in drugs. In despair, she finally sets out to reveal her possession of the letters to Bertha Dorset, but changes her mind when she realises that to do so will besmirch Lawrence Selden’s name. Instead, she calls on him to say goodbye and burns the letters on the fire whilst he is making tea for her. Next day Selden has finally decided to act on his intention to help Lily instead of being merely a spectator to her life. But he arrives to find that she has died of an overdose, leaving behind a cheque to pay for all her debts to Gus Trenor. 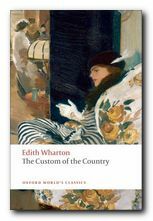 The Custom of the Country (1913) is Edith Wharton’s satiric anatomy of American society in the first decade of the twentieth century. It follows the career of Undine Spragg, recently arrived in New York from the midwest and determined to conquer high society. Glamorous, selfish, mercenary and manipulative, her principal assets are her striking beauty, her tenacity, and her father’s money. With her sights set on an advantageous marriage, Undine pursues her schemes in a world of shifting values, where triumph is swiftly followed by disillusion. This is a study of modern ambition and materialism written a hundred years before its time.